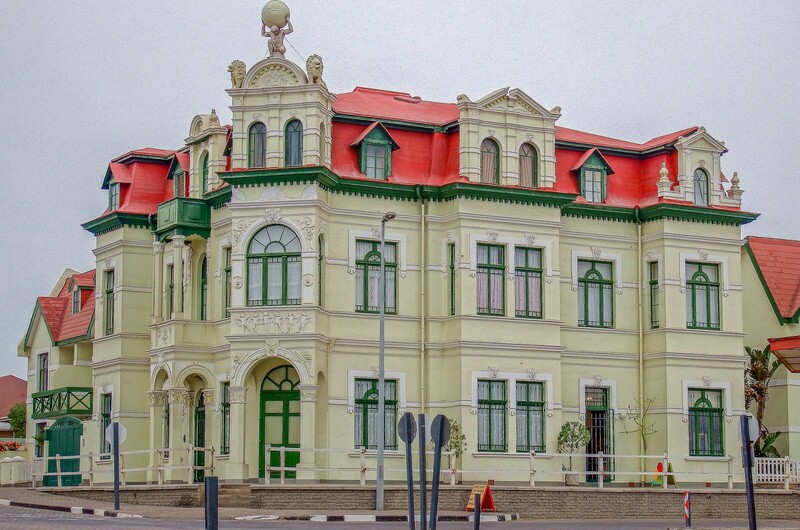 One of the finest colonial buildings in Swakopmund is the Hohenzollern Building , on the corner of Libertina Amathila Avenue (formerly Brücken Street) and Tobias Hainyeko Street. The most obvious feature, on the roof above the front door, is the statue of a kneeling Atlas holding up a globe of the world. In 1988 the original cement figure had to be replaced with the present plaster-of-Paris version. The building, named after the German Imperial family of the same name, dates back to 1909 when it started life as a hotel but in 1912 it was taken over by the municipality after the hotel licence had been revoked by the local magistrate when it became a well-known gambling den. The building was later converted into private flats.